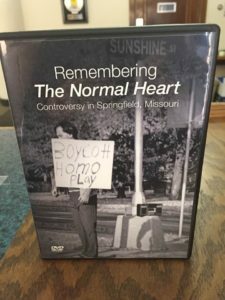 A DVD of Remembering The Normal Heart: Controversy in Springfield, Missouri is $20. Shipping and processing fees are $4.75 for United States addresses. Missouri residents will be charged an additional 8.1% for sales tax. Click the yellow “Buy Now” button below to purchase a DVD.